2015 a year in review! Happy New Year!! We wish you a healthy, happy, safe and prosperous 2016. A second year has passed since the devastating fire, our time we feel to reflect on what has been happening here on the croft! I think we progress more than we think we do, especially when we look at the photographs! January 2015 saw an inundation of water and our first New Year on the croft saw us digging drainage ditches to direct the water away from the fields. Kapitein dug nearly 40 metres, my small offering (although the ditch I was digging was much wider) achieved 2.5 metres, but every little helps so they say. 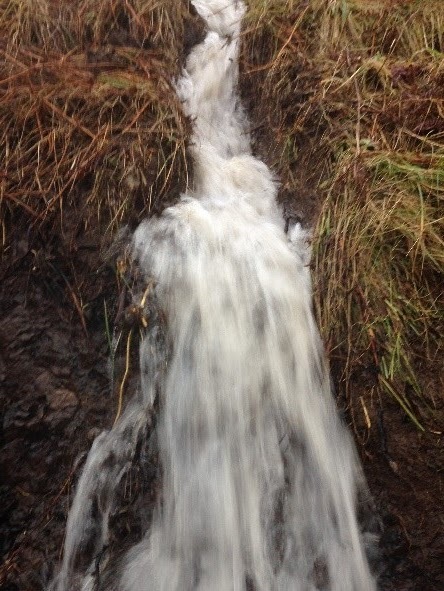 With high winds and more rain forecast I suspect I could be digging some more in the next day or two. February saw completion of the foundations for my work shed and shop, Kapitein managed to lay breeze blocks all through January and early February to give a sound frame for the concrete to be poured. 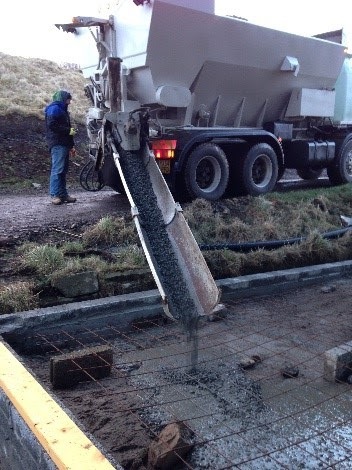 Ross pouring concrete - it even snowed! The Shed duly arrived (albeit 5 days earlier than expected) and building commenced that very day. 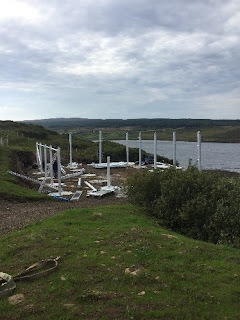 It took just a few hours to get the main frame of the shed constructed - a bit like putting together some over-sized jigsaw. Initially access was via steps, but a short while later we were able to install a more 'user friendly' access which works a treat. Easter and the shop was open for business stocked with many different hand knitted items I had made during the winter months. I was also assisted by several local hand knitters who have worked tirelessly to help me rebuild my stock levels. 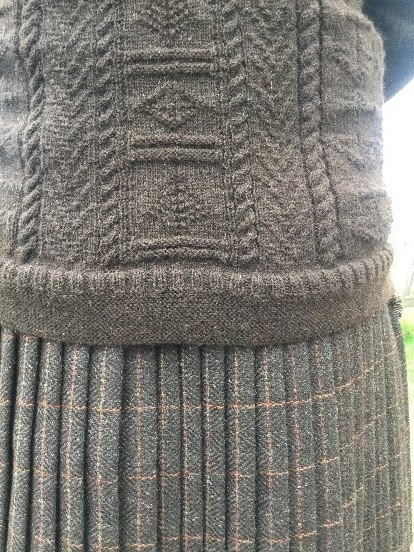 And this year for the first time, we produced our very own home grown and Skye woven tweed. This has proved hugely popular with handbags, hip flasks and waistcoats sent worldwide. 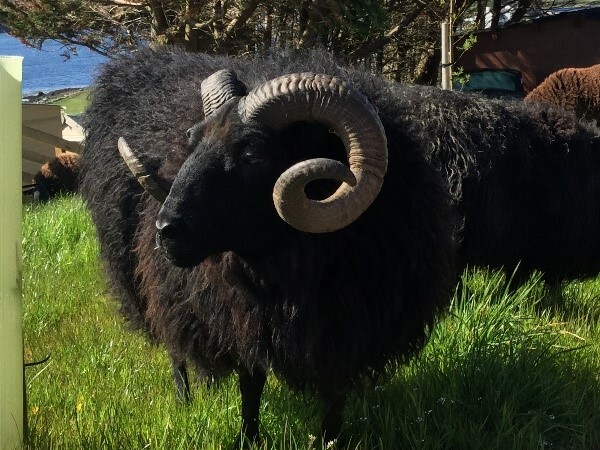 All thanks to our wonderful flock of Hebridean sheep! All stocked and ready to go and with a knitting area too. 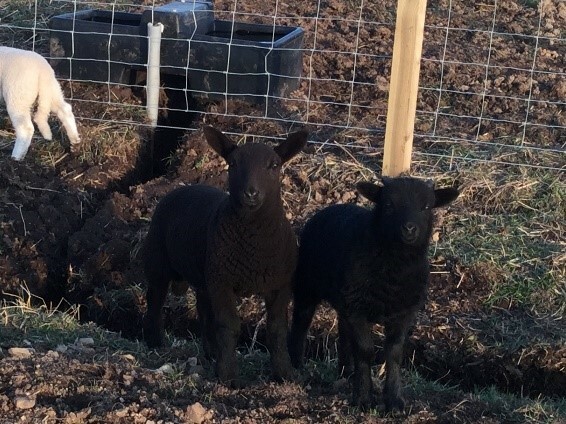 Also during April and lambing was in full flow, the Hebrideans and Black Cheviots producing some wonderful lambs – with proud fathers watching on, we could not have wished for anything better. Albeit we did have bleary eyes! Up before the larks and still checking the girl’s way past midnight – all in a day’s work for us.We had an extra special girly this year, here she is with the hens who I am sure believe they are indeed sheep! May and the weather did improve! If only for a few days but a welcome break none the less. 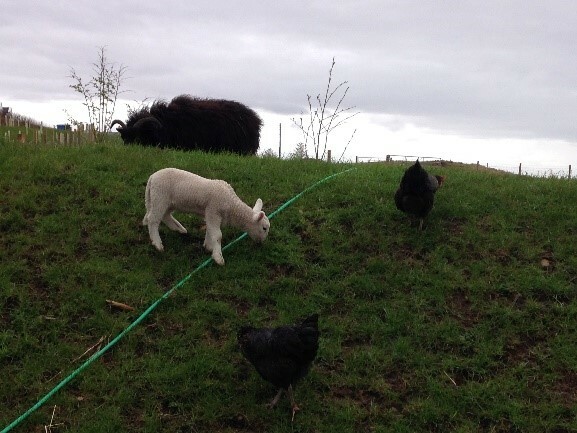 This gave the opportunity for the 'boys' to be out and about on the bunds where there was grass in abundance. The 'Big Fella' is always up for a photograph. He is such a handsome chap. This is 'Big Laddy' The Black Cheviot tup and 'Skyefall (our pedigree Hebridean tup) both lambs are still the best of friends and follow each other everywhere. And get into great mischief whereever they can. They became the best escapologists of all... But always happy to go back with the others, especially when encouraged with food!! June, July and August and we were busy, busy busy in the workshop. We have had some delightful visitors here to the croft from all corners of the globe. Everyone has been delighted in being able to get up close to our sheep as ultimately everything I make comes from their fleeces. 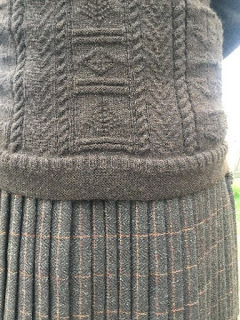 The wool, the knitted products and of course the tweed. You can’t get better provenance than this, especially when you can touch next year’s wool as it grows on the back of the sheep.We have met some wonderful people, one lady who visited with her husband and who has been following the blog. She asked if the Electricity supply was sorted! 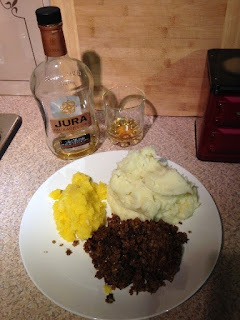 I realised then I hadn't been updating the blog! So we took the time to show her our progress. I was thrilled to meet her and hope to welcome her and many, many others back again this year too. In-between working in my shop, knitting, sewing and designing knitwear both Kapitein and I have been working at Dunvegan Castle. Kapitein – as a fully qualified commercial Skipper worked on the seal boats, taking visitors out to view in excess of 300 native common seals. Whilst I worked within Dunvegan Castle as a tour guide. This was a welcome break from all things sheep and I had the privilege of working within a superb team and of course I met some fantastic visitors here on Skye. Late summer is the show season for most of Scotland which for us started with Dunvegan show closely followed by Portree Agricultural show. My flock of sheep received a very warm welcome and won first prizes in both shows. I am especially proud of my Hebrideans which won reserve champion at Portree. I was privileged and honoured to be awarded a plaque which is on display in my shop. I am permitted to keep the trophy for one year – until the Portree Agricultural Show in August 2016. Who knows who will win it this time, we will have to wait and see. 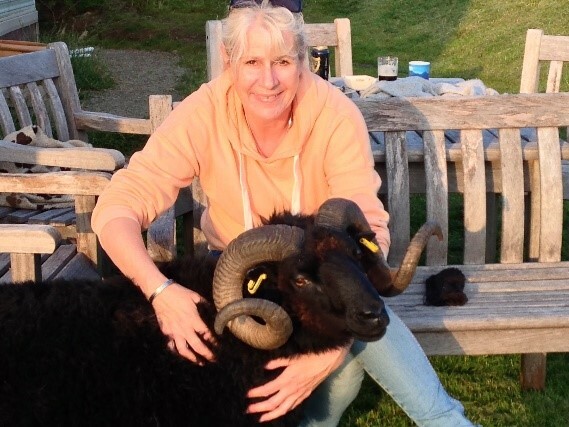 Here I am for the very first time in a show ring at Dunvegan show with these my two wonderful Black Cheviot Shearlings Harry Hotspur and Ralph Percy (pronounced Raaf Porcy) Ive got Harry and the wonderful gentleman in front of me is handling Ralph. I am especially grateful to everyone who helped and supported me that day. Especially to Magnus (sheep handler extraordinaire) and Kenna (official photographer) the guys in and around the show ring and the huge support from my colleagues at Dunvegan Castle, this was a very, very special day indeed - thank you to one and all. And there is more… Whilst Kapiten and I were working we had the Bernisdale Boys back. 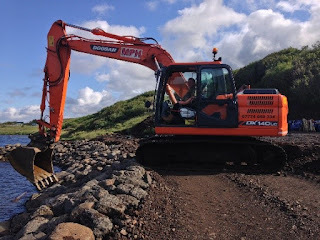 DJ arrived with the even bigger digger and set too building the much needed sea defences down on the shore. One balmy summer evening, I was taking in the remaining view just before sunset when a sheep came to the garden gate. I had to let him in!! How could I resist!! He has become so popular, a very special artist, Linda Foster has painted a wonderful portrait of the Big Fella, she has really captured the likeness and her style of painting is just wonderful. The print is available on our website on the page listed 'Big Fella'. Watch this space for more 'Big Fella' merchandise this coming spring. The very beginning of the shed build we were once again helped by a fantastic band of folk. Stephen (my son-in-law) aka the Mechanic (little miss no no gladly kept everyone going with teas and coffees!!) General 'Dogs Body', I am sure you will get to know more of him as time goes on! Brian, Salty - not quite a 'sea dog' as he's in training, John the very, very professional Bernisdale Boy, Andrew, Gerry and of course Kapitein. I am immensely proud of all of them and hey voila we have a shed! If you ever see any of the above team and especially John - the Bernisdale Boy, just don't mention the roller shutter door! If you do, ask him where the digger was!! John went out on a high, as he has since changed jobs (no I don't think that it was the building of the shed that 'finished him'!!) He has moved on to pastures new and we wish him every success with his new endeavours. He has been with us since the start here on the croft and without him, we know we would not be as far forward with our plans as we are, a truly great guy - 'Kettle's always on John'!! 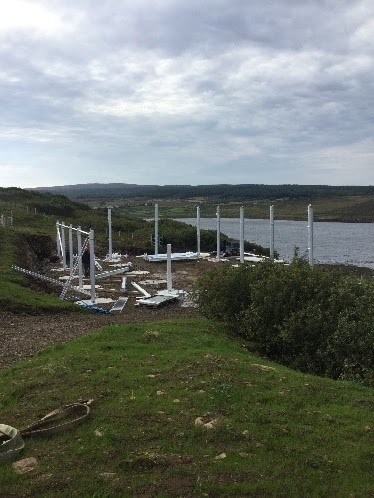 But he has left us in very capable hands and in the photo is Ali from Sconsor with the sub base going down in preparation for the shuttering (its all technical stuff - or so they tell me). Watch this space for further collaborative work with Gordon in the future here on the croft! 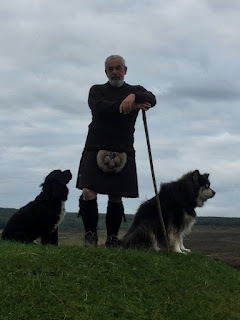 The kilt is just amazing to see - we have sufficient material to make just 2 more so if you're interested, do get in touch with us or pop along to the croft to see the orginial for your self. We celebrated our second Christmas here in the caravan. We had the obligatory storm just prior to Christmas Eve, including snow – it didn’t stay, but on the day it was calm and we even saw the sunshine too. I have hardly touched on the immense 'goings on' down on the croft. 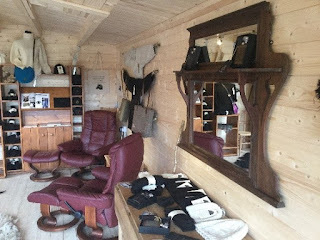 But for more catch-ups we had a dedicated Facebook page where you can find out news, offers, courses and this is where we upload our video's too. And last, but by no means least, we would just like to say a huge thank you to all of you who have supported our endeavours, either by working with us, just visiting, shopping with us, participating in courses and the ' In Stitches' ladies who just make life worth living, it has been truly amazing to meet everyone.